First up is Gingerbread. While its stranglehold on the distribution chart is still going strong, it has dropped off just a little bit since the last cycle, sliding from 60.3% of all devices to 57.5% last month. 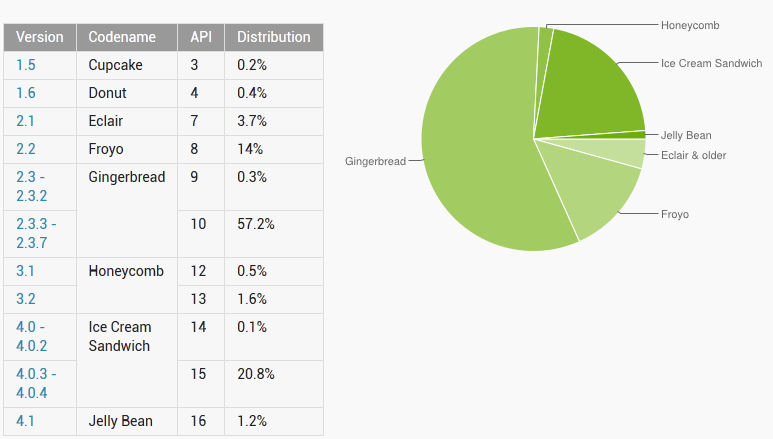 Ice Cream Sandwich, meanwhile, has climbed from 15.8% to nearly 21%, which definitely sounds promising. That being said, it looks like Jelly Bean is going through the same arduous climb we've seen from other Android releases, jumping from 0.8% to just over 1% last month. As usual, Google also provides a historical distribution chart, with the oldest Android iteration on top and all subsequent versions steadily growing below. Google's report also includes handy stats for developers like screen sizes and densities and Open GL version.